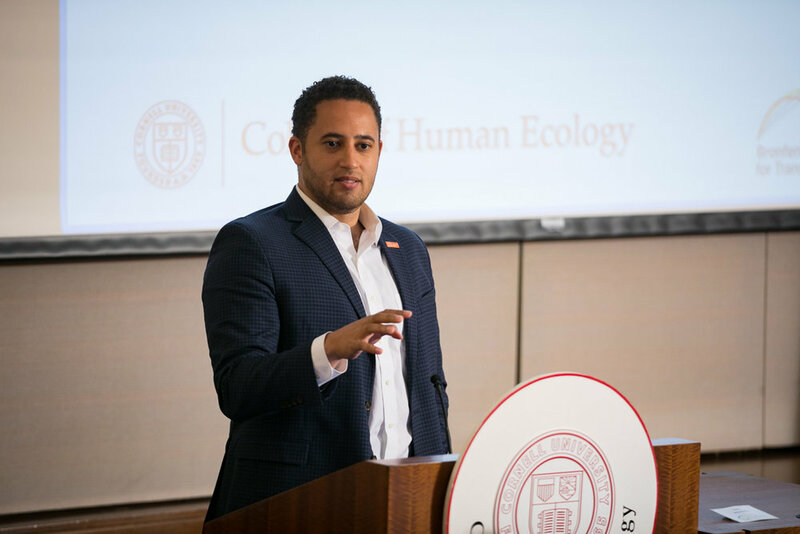 At the Cornell Project 2Gen kickoff event, Ithaca’s Mayor Svante Myrick discussed the necessity of housing, transportation, and employment in helping families lift themselves out of poverty. Myrick illustrated these fundamental components of economic mobility by describing their impact on his own childhood, which he spent in and out of homelessness. Myrick described one period of his life when his family secured high-quality, affordable housing, but had to walk a grueling six miles to get to the nearest grocery store because there was no nearby transit system. Myrick’s family lacked one of the key components of economic mobility—access to transportation—and as a result, his mother was too exhausted at the end of the day to invest fully in her or her children’s education. In contrast, when his family moved to a place where he and his siblings could access transit by themselves, his mother was able to work two minimum-wage jobs and he and his siblings could participate in enriching after-school activities, such as Head Start, without relying on her to drive them. As a result of this increased academic involvement and community participation, Myrick and his siblings all went to college and eventually were able to lead economically successful adult lives. Myrick’s experience exemplifies the interdependence of housing, transportation, and employment, and shows that all three are critical in escaping the cycle of poverty. In a study on the relationship between residential location, transportation, and employment outcomes of housing voucher recipients, the Urban Institute found that transit access appears to be the most important factor associated with maintaining employment. Their analysis showed that when a family moves to a neighborhood with access to better transit and lives within fifteen minutes of a bus stop, the probability of having consistent employment raises by a factor of fourteen. Housing plays a central role in economic mobility partially because its location determines whether a family lives in a transit-rich neighborhood or car-dependent neighborhood, which limits access to employment. Additionally, there is discrepancy between the where jobs are located and where people live. The Brookings Institution found that the typical worker—based off a sample of one hundred metropolitan areas—can only reach about seven percent of the jobs in his or her region within a forty-five minute commute. This spatial divide is most severe for low- and middle-income families, whose options for housing are located particularly far from the occupations they are qualified for. As an increasing number of low-income families move to the suburbs, this gap will continue to widen and transportation will become crucial in determining access to employment. The affordability of housing also has a significant impact on family outcomes. When families spend a disproportionate amount of their income on housing, children experience poorer health outcomes, lower levels of engagement in school, and emotional and mental health problems. Children who experience homelessness or hypermobility—often a result of a lack of access to decent, affordable housing—are more likely to drop out of school, repeat grades, , disengage in the classroom, and suffer from learning disabilities and behavioral problems. On the other hand, access to quality, affordable housing helps create a stable environment for children by reducing family moves and avoiding the negative impact of moving on educational achievement. However, despite the clear benefits of affordable housing and transportation access, attaining both does not guarantee that low-income families can achieve the third crucial element: employment. The Urban Institute Study explains, for example, that while public housing residents, typically located in central cities, live in closer proximity to jobs than households with vouchers, public housing residents have difficulty obtaining these jobs due to intense competition. Efforts to improve outcomes for low-income families must focus on coordinating access to all three components that Myrick described in order to achieve economic mobility, not just one or two. Building and preserving quality affordable housing near transit, making public transit more reliable and efficient, and developing job training programs are all ways to integrate these components and help families lift themselves out of poverty. Land use policies that promote the interconnectivity and proximity of jobs, housing, and transit can also help families achieve economic mobility by restructuring the physical layout of communities, making them more accessible for people of all income levels. Pendall, Rolf, et al. “Driving to Opportunity: Understanding the Links among Transportation Access, Residential Outcomes, and Economic Opportunity for Housing Voucher Recipients.” Urban Institute, 31 Mar. 2014. Tomer, Adie, Elizabeth Kneebone, Robert Puentes, and Alan Berube. Missed Opportunity: Transit and Jobs in Metro America. Brookings Institute, May 2011. Harkness, Joseph, and Sandra J. Newman. “Housing Affordability and Children’s Well-being: Evidence from the National Survey of America’s Families.” Housing Policy Debate 16, no. 2 (2005): 223–255. doi:10.1080/10511482.2005.9521542. Brennan, Maya. “The Impacts of Affordable Housing on Education: A Research Summary.” Center for Housing Policy, 2011.